Note to readers: The news platform profiled in this article, 1 Haber Var, was shut down this summer due to financial difficulties after work on this article begun. However, we have decided to publish this article nevertheless to showcase the types of efforts that Turkey journalists are undertaking to preserve independent journalism. According to a recent report by respected Turkish academics Dr. Yaman Akdeniz and Dr. Kerem Altıparmak, “Turkey: Freedom of Expression in Jeopardy”, a total of 200 media outlets were closed during Turkey’s two-year state of emergency that ended on July 19, 2018. Media organizations shuttered included news agencies, newspapers, magazines, radio and television channels, publishers and distributors. Yet as these media have been forcibly shut, new ones have sprung up in an attempt to keep the free flow of information alive in Turkey, many led by dedicated journalists who had lost their jobs elsewhere. Over the last two years, former employees of the shuttered outlets Özgür Gün TV, Azadi TV, Jiyan TV, Van TV, Gün Radio, Radio Dünya, Radio Karacadağ, Rengin Radio, Ses Radio, Özgür Güneş and Özgür Radio have worked to build a public audience for a new platform called 1 Haber Var. Fuat Yaşar is one of the reporters who works at the Diyarbakır-based news platform, which broadcasts in Kurdish and Turkish. Yaşar, 27, began his journalistic career at İMC TV before moving to Van TV, both of which were shut down by emergency decrees. “Both the place where I learnt journalism and the place I continued working in it were closed, but this led me to the right address,” he said. Yaşar believes that İMC TV and Van TV were closed because they did not broadcast the government line. The seizure of all equipment at the two shuttered stations made already difficult conditions even worse for those who worked there and who wished to carry on with their journalism. 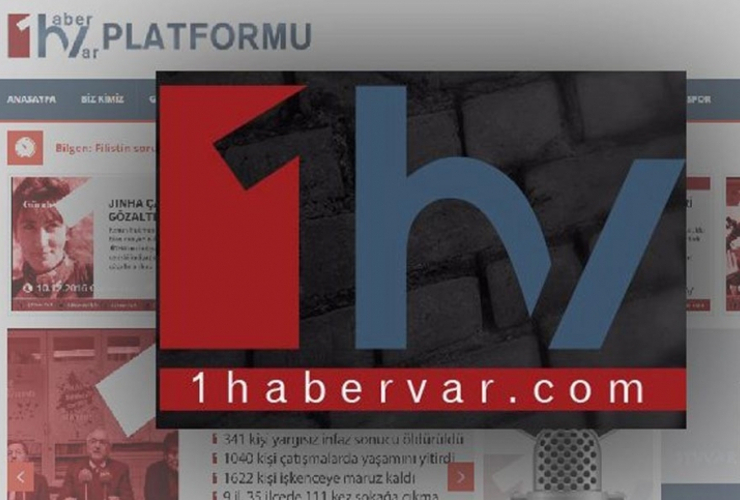 As one of the reporters instrumental in the establishment of the 1 Haber Var platform, which uses the Scope application to broadcast live over the internet, Yaşar explained how the team now seeks to do journalism with limited resources. Yaşar said that the new platform’s name, which means “There’s news!”, contains the message that even if media institutions are closed down, there is always news wherever there is a journalist. He and his colleagues believe that even if resources are limited, one news item can sometimes make a change. İbrahim Aslan, an editor at 1 Haber Var, formerly worked at the shuttered TV station Jiyan TV as broadcast co-ordinator. Aslan, a journalist for 15 years, explained the process of how the broadcasting platform has come together since November 2016. Despite their dedication, 1 Haber Var’s journalists face both financial difficulties and legal obstacles. The platform was officially closed twice in 2018 by administrative order. Viewers in Turkey can only access the site via a VPN, though 1 Haber Var continues to broadcast through social media channels like Facebook and Twitter, where censorship still remains a threat through government requests to take down content. “We operate on the idea that our news should reach the public, even if it is with a tweet,” Aslan said of the site’s efforts to defy the attempt to silence it. Still, the closure order has severely impacted 1 Haber Var’s audience numbers. Aslan explained that prior to the ban, 300,000 people per day accessed the site. Afterwards, that number fell to 100,000. Impending legal troubles add to the site’s problems. The prosecutor’s office in Diyarbakır recently opened an investigation into the platform over allegations of conducting “propaganda for a terrorist organization”. Two newsreaders and one reporter are also being personally investigated for the same offence. Gülistan Korban, who previously worked for the now-closed Azadi TV, is the only woman journalist working at 1 Haber Var, where she serves as Kurdish news editor. Korban emphasized the importance of solidarity and continuing to practice journalism even during hard times. Having helped establish 1 Haber Var and now striving to keep it afloat despite constant oppression, Korban said it made her feel better to work somewhere that combined reporting the news with a sense of solidarity. Still, Korban admitted that the scourge of self-censorship was never far from her mind. “When I am presenting the news and I am reading a sentence, I have to think twice before saying ‘Kurdistan’”, she said. “If I say it, I wonder if I will be investigated. We are always thinking about it. This situation makes things even more difficult, and means you cannot express your ideas. When I have a guest on the program, I think, ‘What will they say, will there be a problem?’ I find myself having to tell them what not to say.